There’s something magical about the idea of remodeling a child’s room. Finally, you have the chance to create a perfect world of imagination for your little prince or princess. However, when you get down to the actual design process, the magic starts to fade. Should you let your child take the creative reigns? How do you choose the right furniture for a child? Take a deep breath. Here are our top ten tips for designing a kid’s room (and staying sane in the process). Maybe your daughter truly believes that she’s an explorer in the jungle. Maybe your son thinks that he lives in Legoland. It’s terrific that they have such active imaginations. Nevertheless, turning your child’s room into a leafy jungle or Lego paradise isn’t the smartest design move. In a week, a month, or a year, your children will have moved on to their next adventure, and you’ll be stuck with a bedroom they’re indifferent towards or, even worse, despise. While your child’s interest of the month doesn’t need to become the overarching theme of the room, this is their room. Talk to them about about colors and materials that they like, so that you can (tastefully) incorporate them into the room. 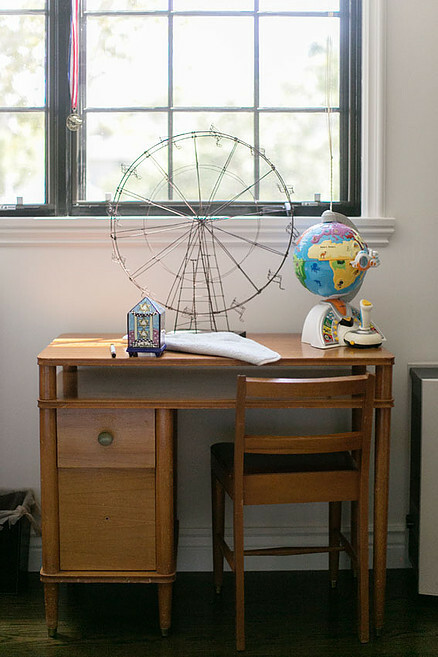 Your child’s bed and desk might be timeless, but that doesn’t mean the room decor needs to be! You can brighten up your child’s room with fun sheets, colorful posters, bunting, and more. Unlike most adults, children spend a lot of time sitting on the floor – playing, reading, and daydreaming. It’s important to make this imagination time as comfortable as possible. While wall to wall carpeting is no longer trendy or practical, putting down a soft, nylon carpet is a comfy option that won’t break the bank. This is a hot trend in children’s room design, and with good reason. Adults and children alike spend a lot of time working from home, and much of this can be done at a more communal workstation, such as the kitchen or dining roomtable. If your child needs a more private workspace, think about moving a desk or two into an untapped hallway. This way, your child has more room to play and think in their room, without necessarily associating the space with homework. An added bonus is that your hallway is infused with color and interest! well so far, making them perfect companions to grow with your little one. and glass nightstands are out. After all is said and done, you’re the parents, and this room is part of your house. When remodeling your kids’ room, it’s important to look at the design in the context of your house’s design sensibilities. If you’ve gone for a rustic barn-house vibe throughout the rest of the house, having a kids room that’s channeling Dracula’s castle isn’t ideal. As always, decide on a budget beforehand – and stick to it. All of the joy of designing a children’s room depends on you being comfortable with the money you’re spending on it.